Complete Album FREE to stream or download now! Kids will laugh, dance, jump, and learn! Get it NOW! 3 EASY ways to stream & download. All 20 tracks as well as the album artwork is included! 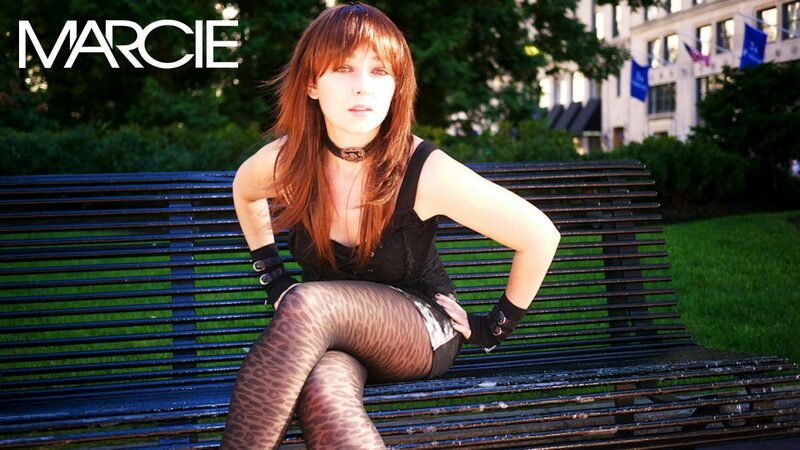 As a singer/songwriter, Marcie has made a name for herself in the dance music scene with Top 10 releases worldwide. With a degree in psychology, Marcie has spent a decade working as a nanny, camp counselor, tutor, and children’s musical choreographer. Marcie is currently pursuing a master’s in elementary education. 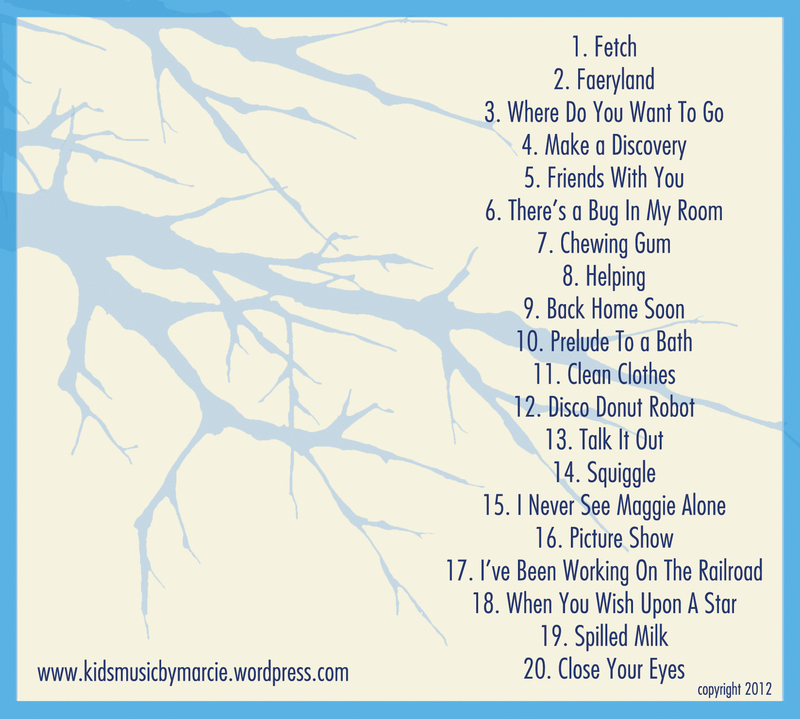 Make A Discovery (Songs for kids) is Marcie’s full length album geared for healthy child development. The album was initially funded through Kickstarter, and as thanks to fans all around the world, the complete album (20 songs) is offered free for all! Picture eBook included. Make A Discovery features 20 sing-a-long songs ranging in musical genre and topic. Highlights include the lighthearted anthem Fetch, the energetic Squiggle, and the quirky Disco Donut Robot. There’s also the earnest Friends With You. Back Home Soon received early acclaim from critics for its comforting message that deals with school anxieties and separation issues. Make A Discovery encourages the use of imagination, kindness to others, respect for each other’s differences, the importance of communication, and the idea that we all learn from our mistakes. 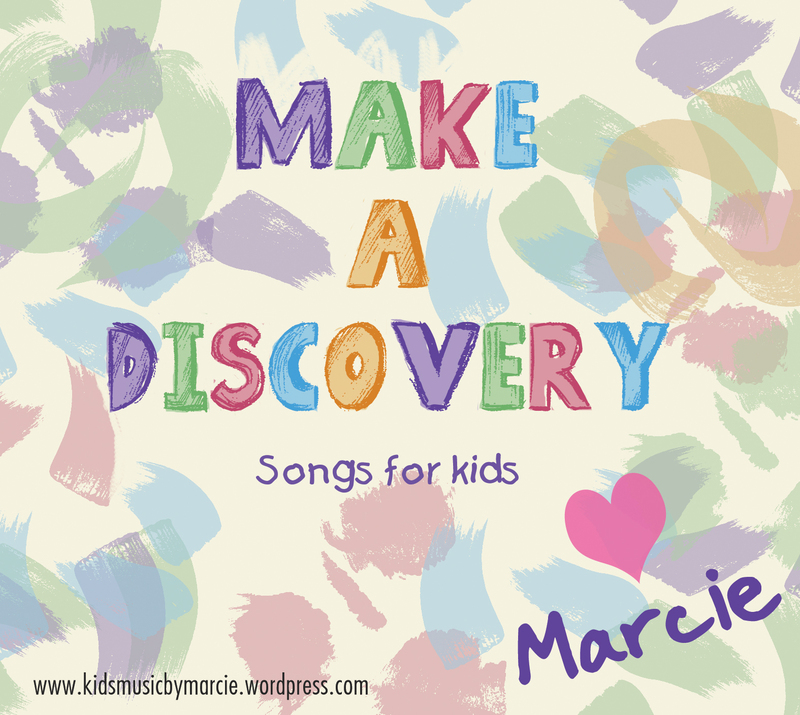 Make A Discovery is full of funny, energetic, thoughtful songs that will get you and your child singing, smiling, and dancing along. 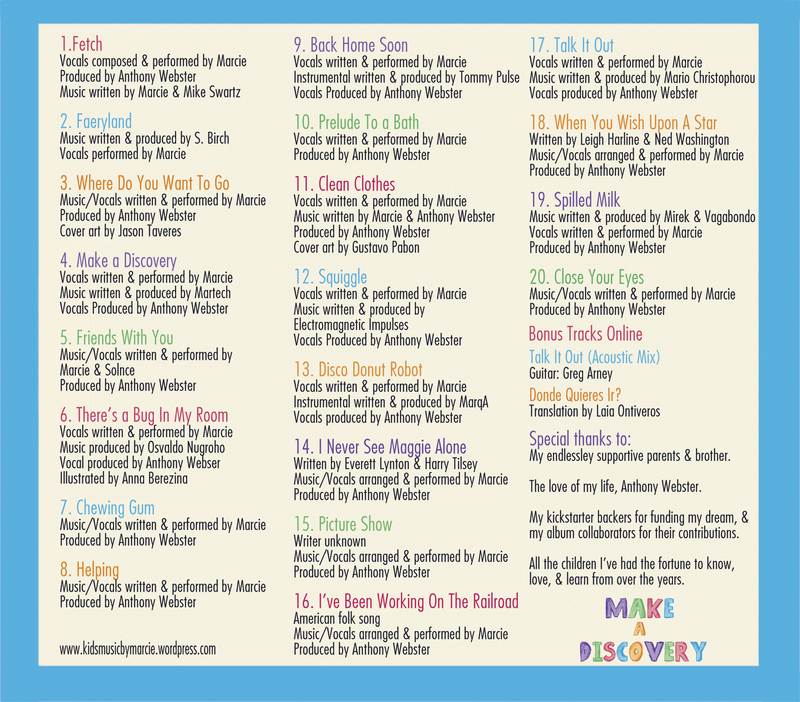 Make A Discovery includes collaborations with guest artists from around the world, two bonus tracks and FREE picture eBooks. “There’s a Bug in My Room” comes with a free picture ebook adaptation formatted for all eReaders, (download here). Download the FULL Album! FREE to stream or download now! All 20 tracks as well as the album artwork is included HERE. Click links to stream and/or download on Soundcloud and Bandcamp. Click album art to enlarge!